The following chapters explore the subject of Resilience and Renewal from the viewpoint of the practicing magician. The tools and models we will apply, however, will not be ‘magical’ by any means. Instead they stem from various fields of modern research such as behavioral science, science of sports or performing arts. Such choice of tools is not meant to devalue any magical approaches on the subject, but rather highlight their wide absence in the Western Tradition as we will see. Still, irrespective of their origins none of these tools will work unless they are practically applied - repeatedly. The ultimate goal of this introduction is to support each one of us on our ongoing journey towards looking after ourselves. The premise from which I am writing - and trying to lead my own life - is that the more skilled we become at this single task, the better life on this planet will be for all of us. Once we are not only empowered but also able and willing to satisfy our own needs, we will be able to encounter other people for what they really are and need from us - free from our own self-worth-craving projections and filters. Such non self-centered engagement is one of the most wonderful things possible on this planet - as the source of all the difference in personalities, opinions and lifestyles between us turns into the source of constant learning, revision and adoption. Yet, whenever we haven’t taken care of our own needs - i.e. whenever we encounter the world in a state of neediness - the same source of diversity and newness will turn into the heart of the monster many people call their lives - full of cognitive dissonance, inconsistencies, lack of self-value and personal recognition. The choice is ours. As magicians we have access to an unparalleled wealth of resources to enhance and manage our energy level. In theory thus adepts of our craft should be adepts at controlling the state of their resilience. Well, I am not sure about you - but so far I haven’t come across any magician who could hold the candle to any professional athlete or dietitian in terms of energy spent and renewal. For some strange reason - which doesn’t shed a very good light on our tradition me thinks - it seems as magicians we have been much more obsessed with the topic of energy under the banner of ‘power and control’ rather than ‘health and renewal’. Today if anyone of us wanted to become more adept at working with energy, the dynamics of renewal and healing, we would need to advise them to rather embark on the journey of becoming an alternative healer or phytotherapist than becoming a magician. Since our ancestors in the early industrial age decided to split the practices of alchemy, plant wisdom and healing from rituals or visions, the Western occult tradition has lost most of its knowledge it used to hold on this matter. One has to dig pretty deep, needs to remain pretty stubborn and open to self-experimentats to retrace the knowledge we once held - and make it applicable in a modern 21st century environment. Of course the latter is out of scope for this discussion. Not only that, I am also far away from being skilled enough to take you on this journey. Luckily for us, Josephine McCarthy is preparing a complete book on this subject which I have been privy to see early drafts of. The wealth of information, practices and advise she is pulling together in this volume on 'body magic' based on decades of her own magical work, contacts to inner teachers and plant-spirits as well as plenty of self-attempts is nothing but amazing. So until this book sees the light of day let’s use our time to prepare. Preparation in this case doesn’t mean necessarily to become a healer ourselves, but more likely to understand the basic dynamics of energy consumption and renewal we are exposed to as human beings. 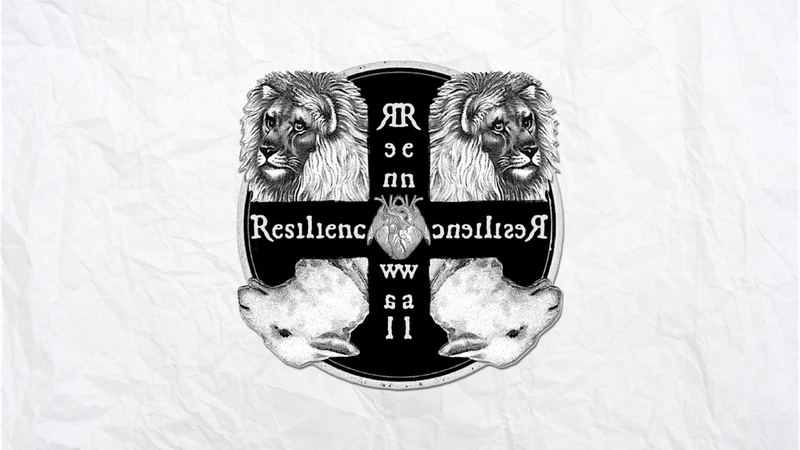 Once we have laid these foundations, understood how we are currently hurting or healing ourselves, then we can move on to explore alternative routes of renewal and increasing our own resilience. 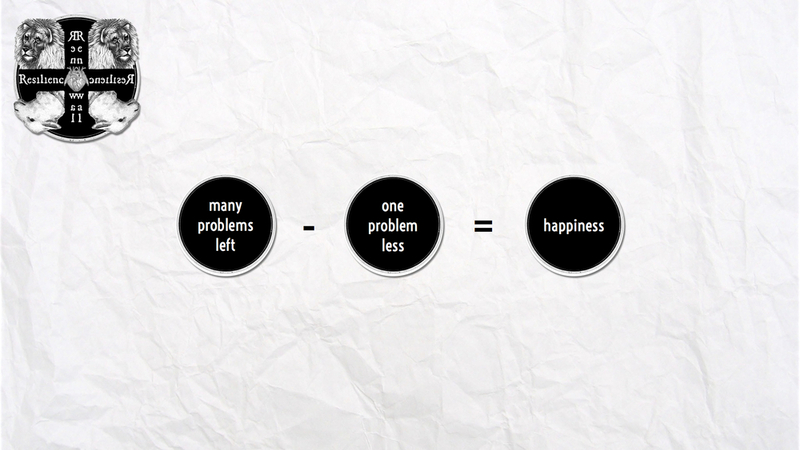 Many years ago I came across a wonderful model on Work-Life Balance management in the Harvard Business review. 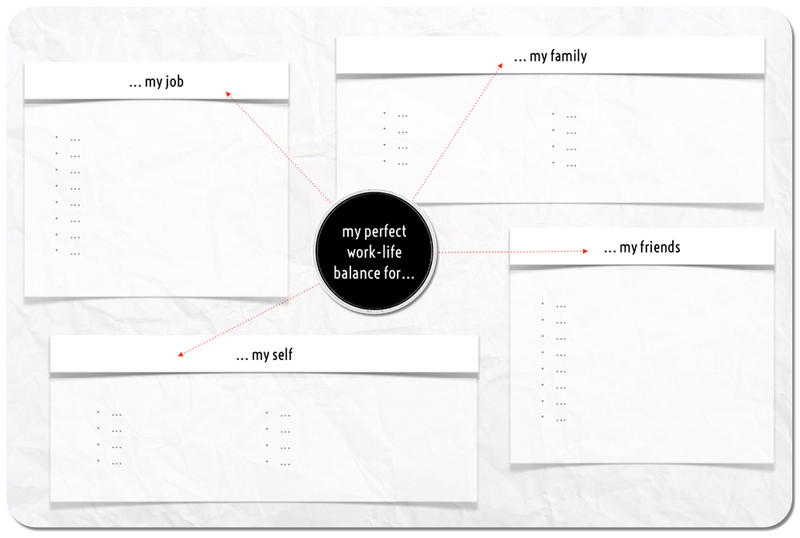 Whatever one thinks of the value of 'work-life balance management' - this model was quite wonderful mainly because it offered a very pragmatic answer to a very complex problem - and could be applied immediately by literally anybody. Well, if you still want to go ahead reading straight away, so be it. Because here is what most of us would have found had they done the exercise: The sheet of paper would have filled up pretty quickly. Wish-lists for friends and family members, sports, cooking, dining and movie activities would have cluttered the sheet in a heartbeat. It's quite amazing how much there is we want to do or be engaged in! Most of us actually are unconscious about the sheer amount of things we ‘want’ for ourselves or others. Now, of course we don’t get all that we want. And that's why so often run around left with the feeling that life - or someone - owes us. Someone owes us just because there are so many un-ticked boxes in the unconscious wish-list that would make our perfect lives. So the first step in becoming more adept at managing our own resilience and energy levels is avoiding precisely this trap: wanting too much! Wether we believe we deserve it or not, it’s simply not going to happen. Life is all about making smart choices and that is where any healthy work-life balance (or balance between energy input and output for that matter) starts. In addition to this, such a first step will allow us to gain access to a completely new feeling: and that is Satisfaction. Yes, with a capital 'S' that is! By not allowing us to write down more than 1-2 items in each of the above quadrants of our life map, we can narrow it down what it means to be truly satisfied with ourselves. Of course things will shift and vary over time and that is how it is supposed to be. But keeping each of the four lists so short and tight that they are realistically achievable within seven days of a week will make all the difference. Take a piece of paper and put down your name in the middle. Take as many paper shavings as you'll need and write down all your wishes and desires. Now of course this is not where we stop. 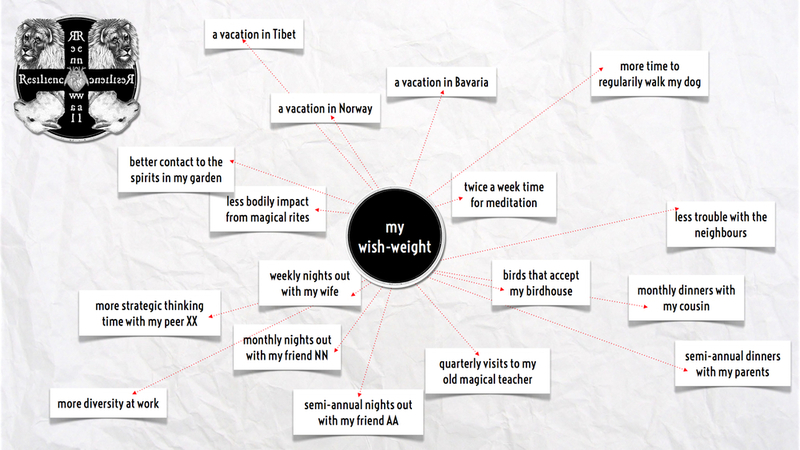 Next, take off all wishes until you are left with what you can realistically achieve in the next three months. Depending slightly on the nature of your wishes this shouldn't be more than 6-10 pieces of paper in total. Remember to start slow and then speed up. After all were in the business of creating satisfaction, and that traditionally comes from achieving the goals we set for ourselves. Constant accessibility of goods, resources, information and social partners as well as an increasing convenience in lifestyles has empowered our wishes to simply take over. Where our ancestors might have had cravings or desires life taught them in nine out of ten cases that not bothering too much about it and simply getting on with work was what would be a good strategy to survive the next year. This changed dramatically with the Industrial Revolution, when desires and cravings were turned into the most essential commodities of all. Fast forward to the 21st century - and here we are overpowered by technological, economical, social and even cultural services and products, which all feed off our inability to say No to our own wishes, to delay pleasures and to balance cravings and prurience with calm and composure. It's our wishes who ruin us - none of them individually but all of them collectively. Of course our generation isn't ‘worse’ than our ancestors were in ‘wishing’. The generations before us simply had the privilege (or burden?) of living in a world that still came with solid boundaries. It is the artificial, digitally displayed and socially reinforced all-availability of any experience at any point in time that puts so much pressure on us these days. Pressure to say No, to know exactly who we are, why we are here and what we are aiming to get out of it. In a world without boundaries, we need nothing more than a heart as solid as a compass.